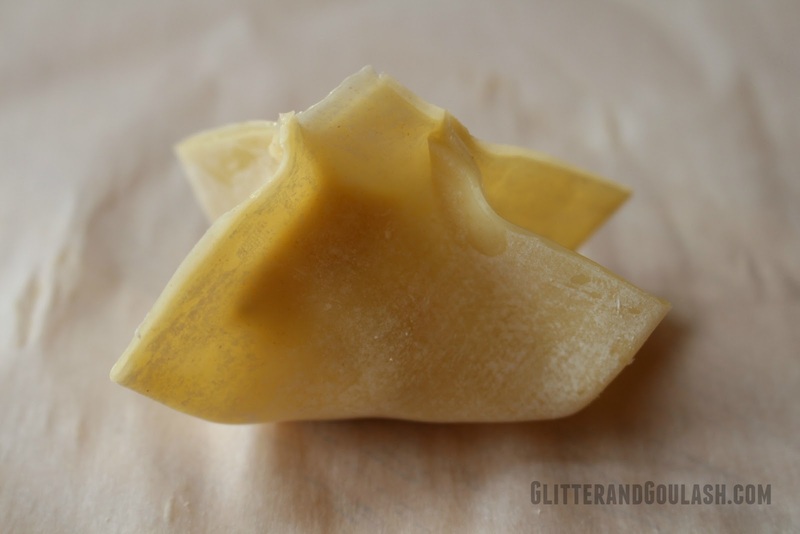 Nothing goes better with any Asian inspired dish than Cream Cheese Won Tons. Oh, who am I kidding…they are wonderful all on their own OR with a main course. 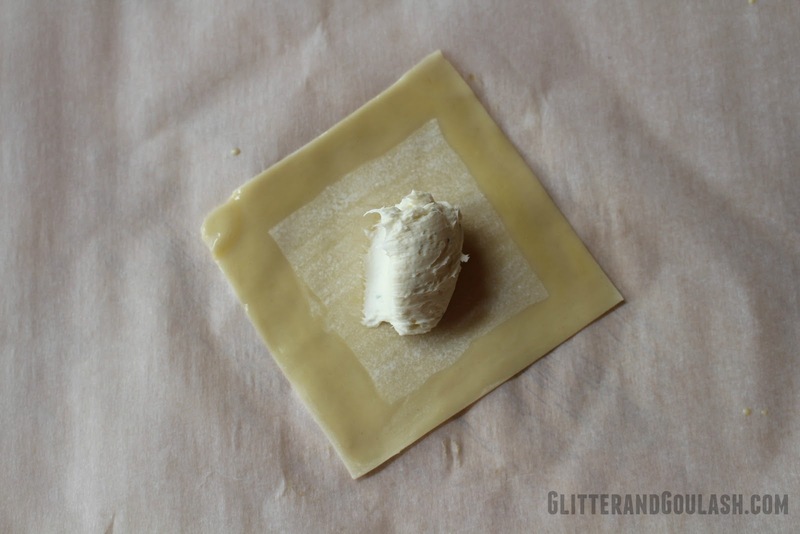 These delicious little cheesy morsels are easier than you think to make. 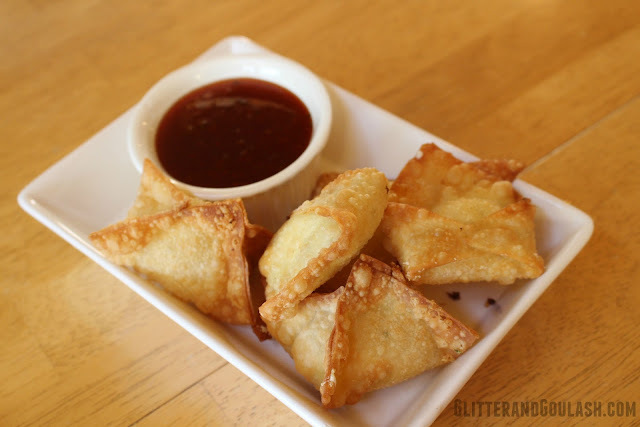 Four easy steps is all it takes…combine ingredients, fill won tons, deep fry, and ENJOY! and a deep fryer (or heavy duty frying pan). 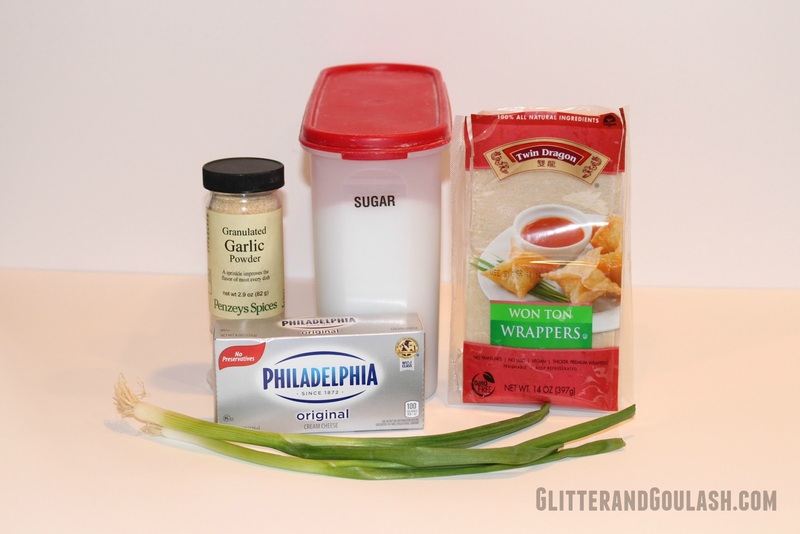 Garlic powder, sugar, cream cheese, green onion (or onion powder) and won ton wrappers. First, combine all ingredients in a stand mixer, or mix by hand until light and fluffy. 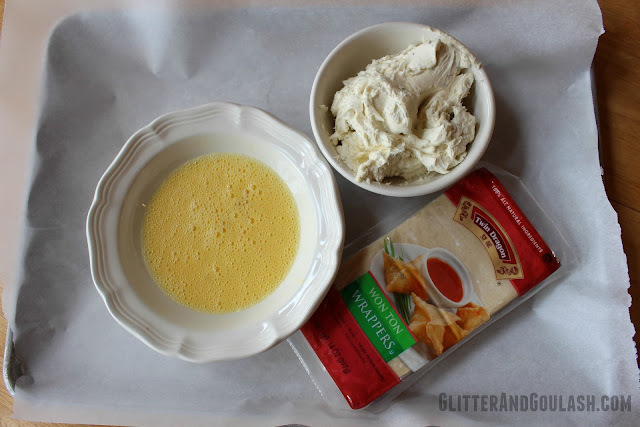 Now that your cream cheese mixture is all combined, you will need your won ton wrappers, and egg wash. Egg wash is made up of one egg and a little water whisked together. 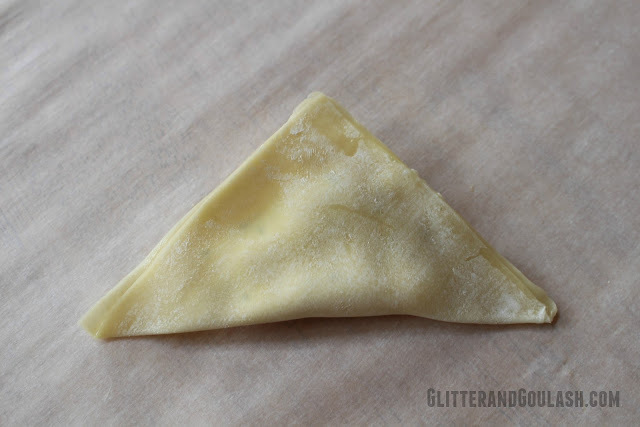 This will act as our glue to hold the won ton wrappers together once filled. 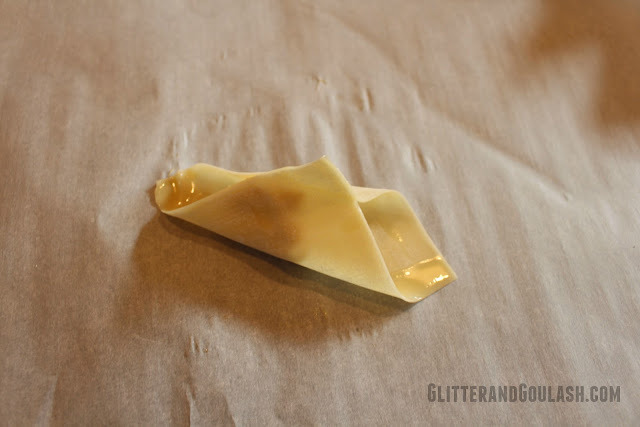 Lay a single won ton wrapper on a piece of parchment paper. 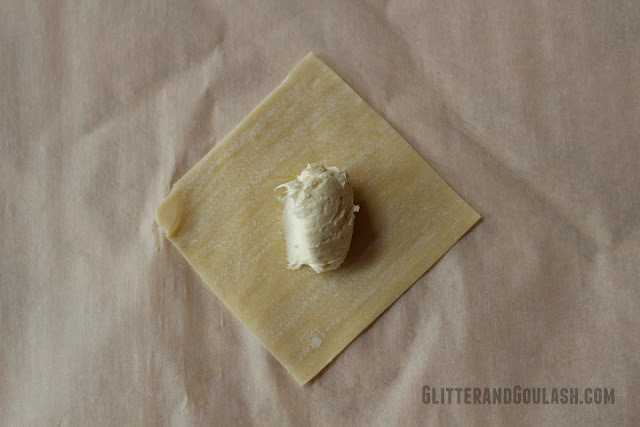 Put about a teaspoon of the cream cheese mixture in the middle of your won ton wrapper. Once the cream cheese is in the middle, put a light layer of your egg wash around all sides of your won ton wrapper. 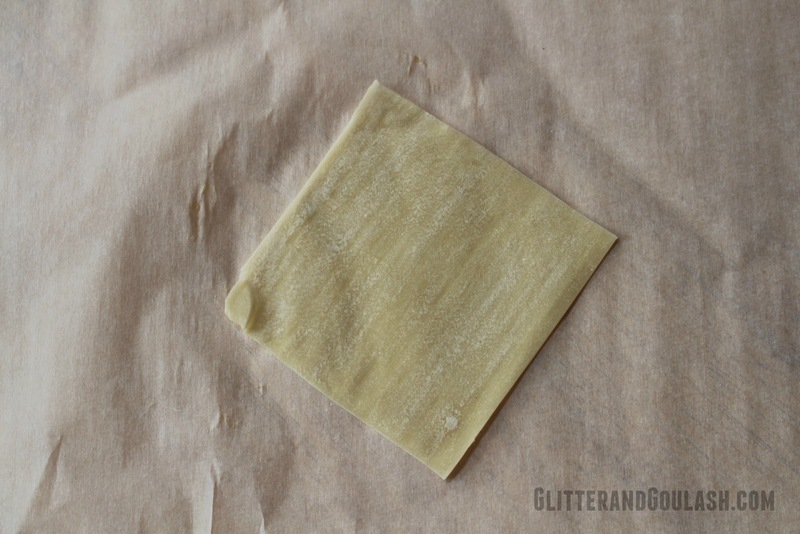 This is a very important step because it will glue the sides of the wrapper together. 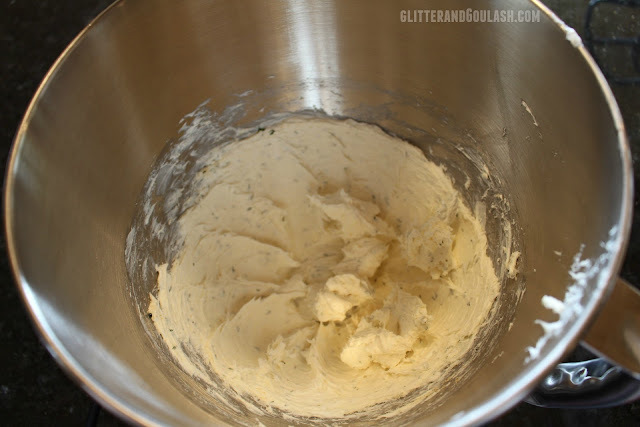 Without it, the cheese will seep out once it is put in the oil and then all you will end up with is deep fried dough. I think it is easier to just get a little dirty and apply the egg wash with your finger, but you could also use a small pastry brush if you like. Now it is time to fold and seal the wrappers. There are several ways of folding them. The first way is to fold them in a rectangle. Simply put the two opposite corners together first. 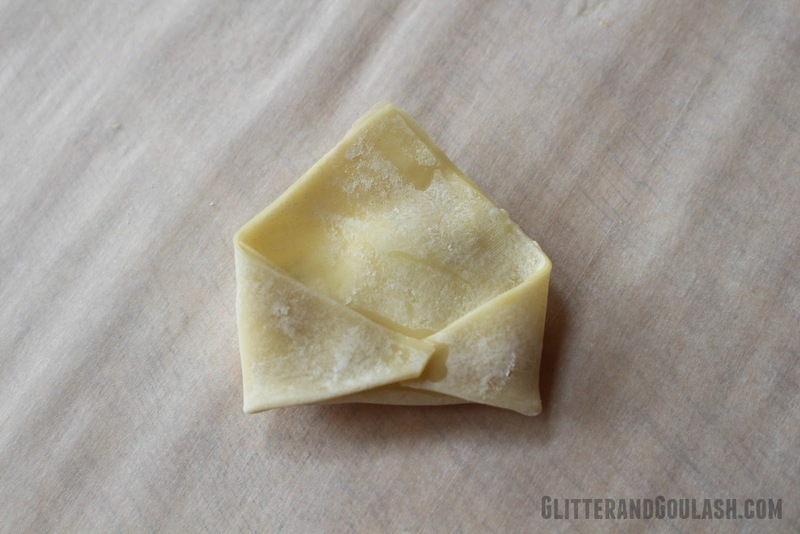 Then, fold the two remaining corners into the middle. Make sure that all pieces of the wrapper are tightly sealed and that you are working the air out as you squeeze all the sides together. There you have your first option. The second fold is simply to bring the opposite corners together like our first option. Then, seal the two sides in a triangular shape. This is by far the easiest fold to make. The third option is the one my family prefers. You simply take the triangular one that you just made above and fold in the two corners into the middle. Basically making an envelope shape. Make sure you put a dab of egg wash in the middle and on each end to glue it all together. Whichever folding option you choose, they all taste the same! It is just a matter of personal preference which one you end up using. Next, preheat your oil (I like to use canola) to 375 degrees. Depending on the size of pan or deep fryer you are using will depend on how many you fry at once. In a standard size pan or fryer, you should be fine frying 4-5 at a time, but wouldn’t do any more than that. Let fry until golden brown, (typically 3-4 minutes) then flip and fry the other side. Once the second side is golden brown, remove, and lay on a paper towel to soak up any extra grease. These can be kept in a 200 degree oven to keep warm while you are frying the rest. There you have it…a delicious, warm, cheesy little treat. 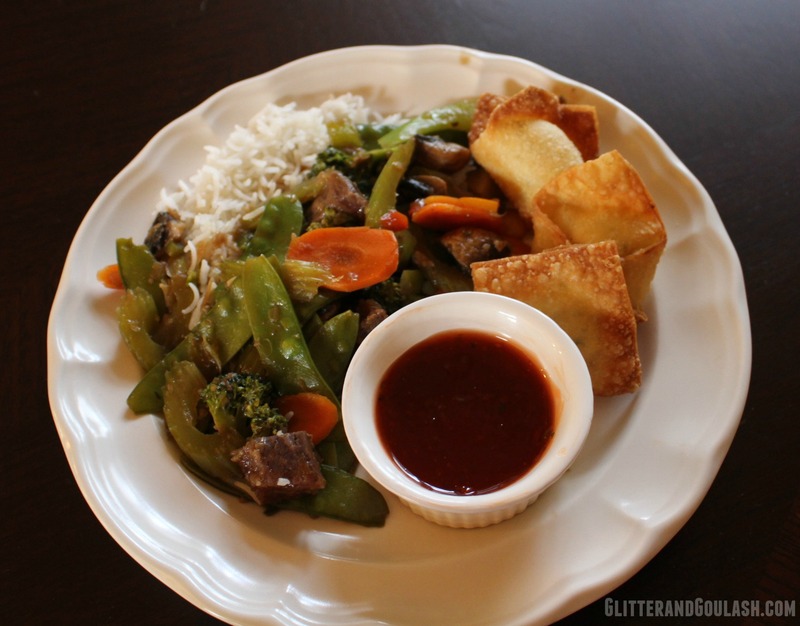 Serve with your favorite dipping sauce on the side such as sweet and sour sauce. And if you absolutely must have a main course to go with these won tons, a nice stir fry over a bed of steamy rice always does the trick! Combine all ingredients in a bowl, mix well. 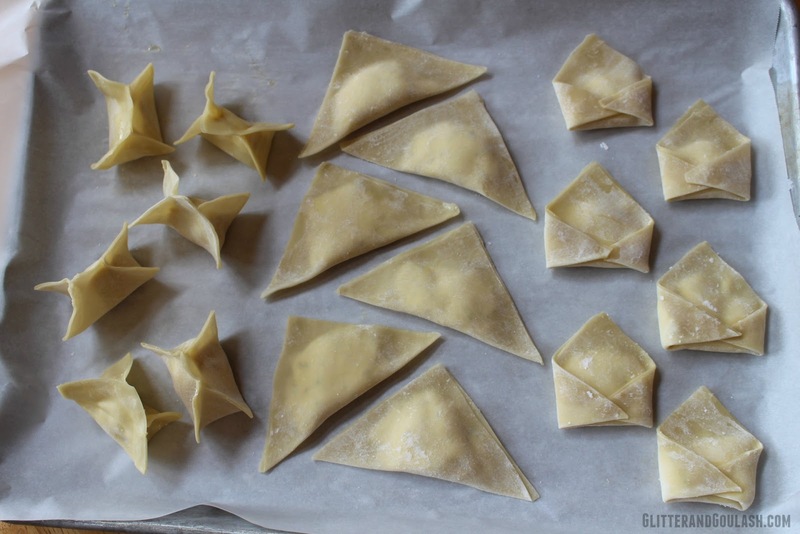 Fill won tons (as seen above) and fry in a 375 degree oil until golden brown. Drain onto paper towels.